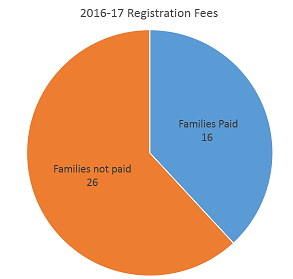 Thank you to all families who have paid their 2016-17 registration fees. But so far only 16 of 42 families have paid. May 4 is our deadline for payment – at next week’s meeting. Please give your completed form with payment to John Scimeme (Troop 410 Treasurer), or Jim Garvey (Advancement Chair), at the meeting of May 4.